The following is a brief introduction to our community and association located at the north end of Pigeon Lake (approx 10 minutes east of Bobcaygeon) in Ontario, Canada. This website is a tool to comunicate current events and information to our members of the association, and local Realtors bringing prospective buyers interested our community. On the public or open pages, such as this Home Page, you will find overview information about our community. We also have secure or private pages that are password protected for only the membership. Important to everyone's privacy, you will also find information on the Canadian Anti-Spam Law that came into affect on July 1st, 2014. Any questions, concerns or help needed with downloading documents please use the Contact Us page and we will respond as promptly as possible. The Alpine Village Property Owners Association (AVPOA) is a Not for Profit Association that is committed to providing specific duties and services to its membership. Doing this with the spirit of cooperation with other associations and organizations with whom it conducts its business. The association is comprised of volunteer Directors who are nominated to the executive each year at the spring Annual General Meeting (AGM). This is achieved with the collaboration of the residents, or voting Members of the association. This process has been repeating since 1978, and the chosen volunteers who accept the leadership positions then continue to conduct the business of the association in good faith, without prejudice, and due diligence for the Membership. The fiscal year is July 1st to June 30th of each year. The AVPOA is governed by its Letters Patent and By-Laws from 1978 to current as defined by the new Not for Profit Corporations Act, 2010. The open Membership page is a quick reference guide for basic AVPOA community information. The secure pages allow Members in "good standing" with annual dues to access the Charter documents, Annual General Meeting (AGM) Minutes, Reports and Financials. The Parks and Docks page is a public page that expands on the cooperation of use for our parkland with regard to current events. Also municipality notices, Fire regulations (temporary fire restrictions) regulatory By Law changes are also posted here. More important are the vital Trent Severn Rules and Regulations that governs our shoreline and waterways. There is extensive information provided on this page we encourage the membership who own a boat, looking for launch and docking priveleges are encouraged to re-visit as each spring season approaches. The Docking Regulations, and Boat Launch Rules and Regulations found on this page will provide any future changes you may need to know. 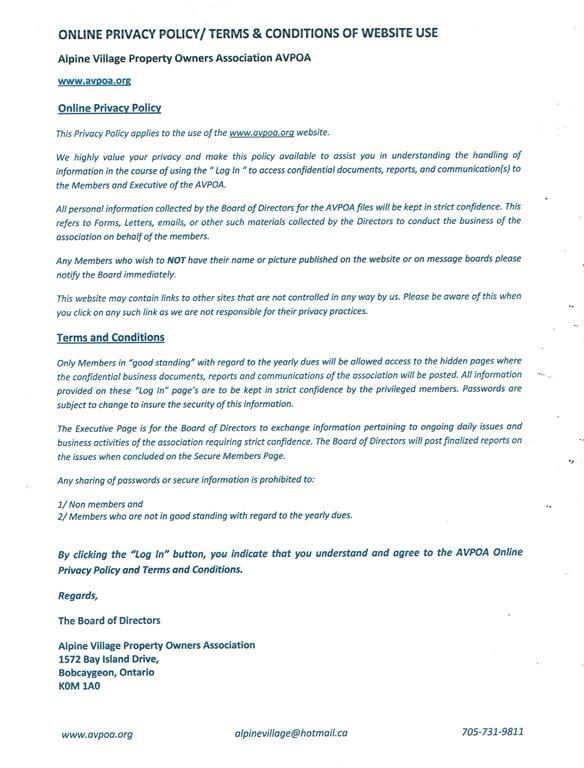 Regarding the secure pages, this is where the AVPOA posts the business and private documents (reports, minutes, financials) for only the membership to view. These pages are password protected for security reasons for only members in good standing. Should you require a paper copy of a document please go the Contact Us page and email your request. For those of our membership who do not have a computer please contact us 705-731-9811.
that has taken over effective July 1, 2018. Starting July 1, 2014 Canada's Anti-Spam Law will regulate all Commercial Electronic Messages sent or received by computer in Canada. This will include electronic newletters from other business affiliations and from the Alpine Village Property Owners Association. Background: Canada's Anti-Spam Legislation (CASL) was passed into law in December 2010 and comes in force on July 1, 2014. There is a 3- year transition period, to July 1, 2017, for certain categories of "implied consent" as described in (a) to (c) below. CASL will regulate all "Commercial Electronic Messages" (CEMs) sent or received by computer in Canada, as well as a broad range of electronic/online activities, including digitally collecting email addresses without consent (address harvesting). Notes; * express consent does not expire; if someone subscribed to your email list before July 1, 2014, their consent stands until they indicate otherwise. Note: express consent cannot be obtained using a "pre-checked box" in an email; CASL is an "opt-in" regime. a) recipient has an "existing business relationship" with a no-profit organization if the recipient was a member, purchased a prdict, good or service from the organization in the preceding two years; or, in the past six months, the organization recieved from the recipient an inquiry about a product, good or service. b) recipient has a "non business relationship" with a non-profit organization if the recipient is not currently a member but was in the preceding two years, or volunteered for or donated to, the organization in the past two years. c) recipient gave business card to sender, or recipient's electtronic address is "conspicuously published" (eg. online) and the recipient has not said " don't send me emails" and the CEM is relevant to the recipient's official role or duties. Therefore; Where there is implied consent in an existing business or non-business relationship that has already included the communication of CEMs, "Businesses and people may take advantage of this transitional period (to July 1, 2017) to seek express consent for the continued sending of CEMs. FOCA represents over 500 cottager associations. Providing support on property taxation, healthy and sustainable environments, effective land use planning, emergency services, rural crime, fire safety, and safe boating. These are Federal and Provincial agencies who govern the waterways, lakes. They provide the guidelines that the AVPOA advocate to the dock and boat owners of the association. This is the Municipal Agency that provides information of the local by-laws, information for Ontario Provincial Police, OPP, Fire Department, By-Law Officers for our law abiding citizens of the municipality.